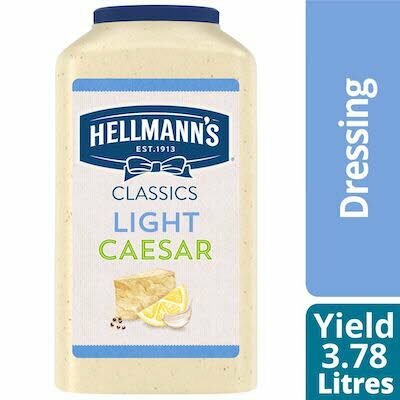 Hellmann's® Light Caesar is made with Parmesean Cheese and garlic, is Gluten-Free, made with no artificial flavours, and does not contain high fructose corn syrup. The Hellmann's® brand is recognized throughout the world for unrivaled quality and flavour and its commitment to real, simple ingredients, real parmesean cheese. Hellmann's® Light Caesar dressing is great for green salads, bound salads, on vegetables, as a dips, sandwich sauce and more.